Notes: This Thames Gold Embossed cover is in pristine condition with a superb clear postmark - not so easy to find now on the full set. 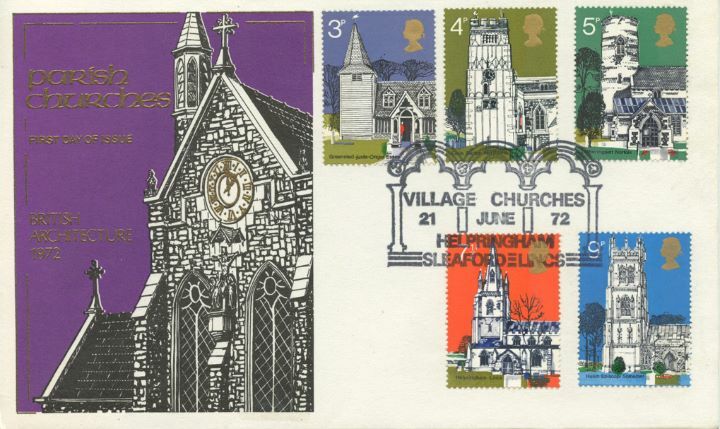 The above Royal Mail Village Churches stamps were issued on 21 June 1972 by Royal Mail and feature the following stamp designs: 3p Greensted; 4p Earls Barton; 5p Letheringsett; 7 1/2p Helpringham; 9p Huish Episcopi. The Parish Churches first day cover with the Helpringham, Church windows, Special Handstamp postmark has been produced by Thames Gold Embossed and features these stamps which can make a very collectible and lovely gift.